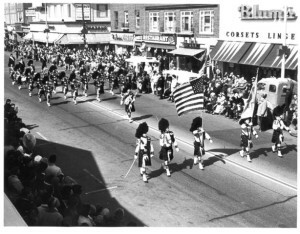 The Amityville Highland Pipe Band consists of a diverse group of individuals. Blue and white collar workers, civil servants, law enforcement personnel, students and others come together to celebrate the tradition of The Black Watch and the stirring music of the pipes and drums. The Amityville Highland Pipe Band is the ONLY civilian band in the world that has been commissioned by Her Royal Majesty, the Queen of England, to wear The Black Watch tartan. It is an honor that the band cherishes, and it is a dedication that each member carries with him into the performing arena: A dedication to represent and preserve the honor, integrity and valor of The Black Watch. At full compliment, the band consists of a Color Guard, Pipe Rank and a Drum Rank. The Color Guard displays the standards of the United States, the American Legion and, on occasion, the Harp of Ireland or the Red Lion of Scotland. These standards are presented under the guard of Riflemen and the command of a Color Sergeant with a saber at the ready. Leading the Pipe Rank is the Drum Major, with his mace and broadsword, conducting the band with precision and pride. The band’s Pipe Rank, outfitted in the Royal Stewart tartan, stands above the rest; creating the unique skirl of the pipes and the bellow of the drones, which have long accompanied clans and regiments into battle. Following the pipers is the band’s Drum Rank. With the unmistakable cadence of its Bass Drummer and the flourishing, syncopated twirls of the Tenor Drummers, the Drum Rank is a favorite amongst patrons and fans alike. Closing out the Drum Rank are the Snare Drummers who complement the marching unit in unison with their crisp and sharp sets. The band performs mostly on Long Island with occasional performances in the surrounding Tri-State area. The month of March and St. Patrick’s Day parades are a band favorite as they perform from New York City’s 5th Avenue, to the shores of Montauk Point as the featured band of the Montauk Point St. Patrick’s Day Parade. Additionally, the band has performed at Nassau Coliseum, opening for The Black Watch Regiment.